Content marketing versus earned media – we wanted to know what is the difference and how can both be used together. 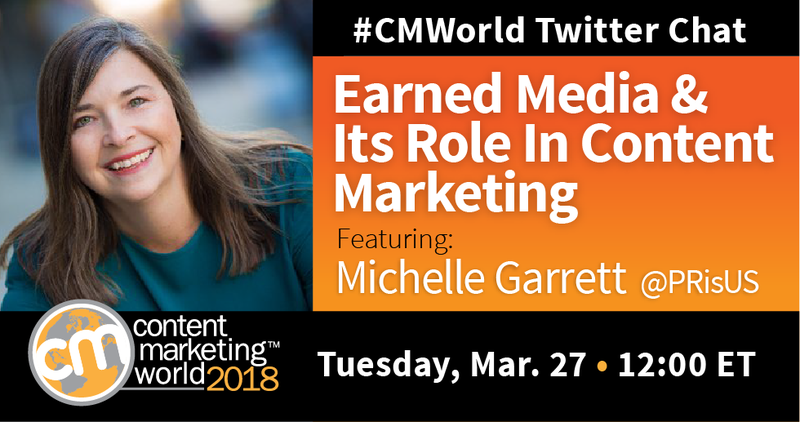 That’s why we decided to invite Michelle Garrett to be a special guest on the #CMWorld chat. Michelle shared her tips, techniques, and advice that can help content marketers get more value from their earned media. Want to see all of the tweets from the chat? Check out our Twitter Moment. Has earned media become less effective? Where can content marketing fill the gap? A2: #EarnedMedia is becoming harder to *earn. * If you’re not generating news, then you’re most likely not going to gain the placements you’re seeking for your #PR efforts. #ContentMarketing can fill the gap (i.e. telling a story your readers can relate to) but it’s not easy. What is the biggest opportunity in earned media for content marketers? Is earned media a part of your content marketing strategy? If so, what success have you found? Let us know in the comments below. Keep up with the latest industry trends. Attend Content Marketing World in September. Register today and use code TW100 to save an additional $100 at checkout.